Holiday gifts in 2018 don’t have to be complicated. It’s that time of year again… Good times and great cheer are just around the corner. And if you’re like most people, you’re just now starting to think about holiday gifts for the loved ones in your life. While giving always feels better than receiving, finding the perfect gift – especially gifts for men – can be a hurdle to holiday happiness. We all have that person in our lives who has everything he could ever possibly need or want – and is absolutely impossible to shop for. Usually, when said person does admit to wanting something specific, it’s a given that it will cost way more than you want to spend. Whether it’s your dad, uncle, brother or husband, these men can make holiday shopping a frustrating chore. That’s why, when it comes to the best gifts for men in 2018, you can’t go wrong with a simple, carnal pleasure everyone enjoys: high-quality hickory-smoked jerky. Easy, affordable and guaranteed to be delicious – what more could you want in a holiday gift for the men in your life? 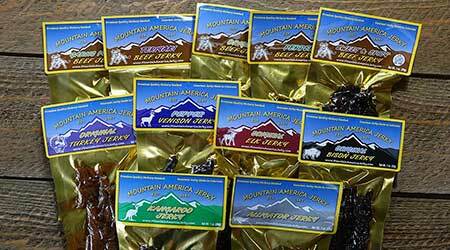 Mountain America Jerky has a wide variety of jerky packages that are sure to satisfy the tastes of every person on your list. And for a little something special you can add a gift box for only five dollars. Shopping for holiday gifts for men doesn’t get much easier than that. For the person who likes everything. The most comprehensive sampler of MAJ jerky, this variety pack gives you a taste of some of our most popular beef, wild game and exotic jerky. 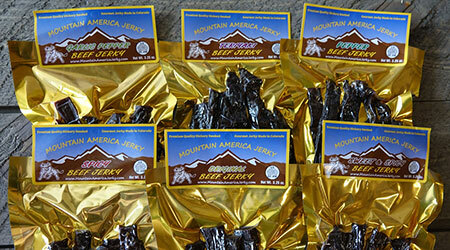 All of our jerky is hickory-smoked, never dehydrated and vacuumed sealed – ensuring that every bite of our gourmet jerky is fresh, moist and delicious. Includes: Original Beef, Teriyaki Beef, Peppered Beef, Sweet & Spicy Beef, Garlic Pepper Beef, Original Turkey, Original Elk, Original Bison, Peppered Venison, Kangaroo and Alligator. Not just for the fisherman’s tackle box. 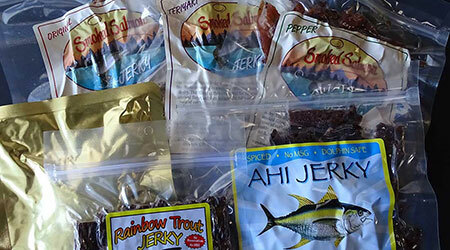 Its name may be counterintuitive, but this fishless sampler packs a lot of meat into one pretty little package. As all of our jerky is 100% handmade and contain no MSG, nitrates, fillers or preservatives, this sampler is sure to cross even the pickiest of eaters off your holiday shopping list. Includes: Beef, Buffalo, Elk, Venison, Alligator and Duck. Perfect for the beef lover in your life, this six pack comes from happy and healthy Colorado cows. We use only lean top round and bottom round cuts (the best cuts for beef jerky) from small-herd, locally-sourced cows and all of our beef jerky is thick-cut, marinated and hickory-smoked daily. Includes: Original Beef, Spicy Beef, Garlic Peppered Beef, Teriyaki Beef, Sweet & Spicy Beef and Peppered Beef. Ask about adding Habanero for a bit of a kick. 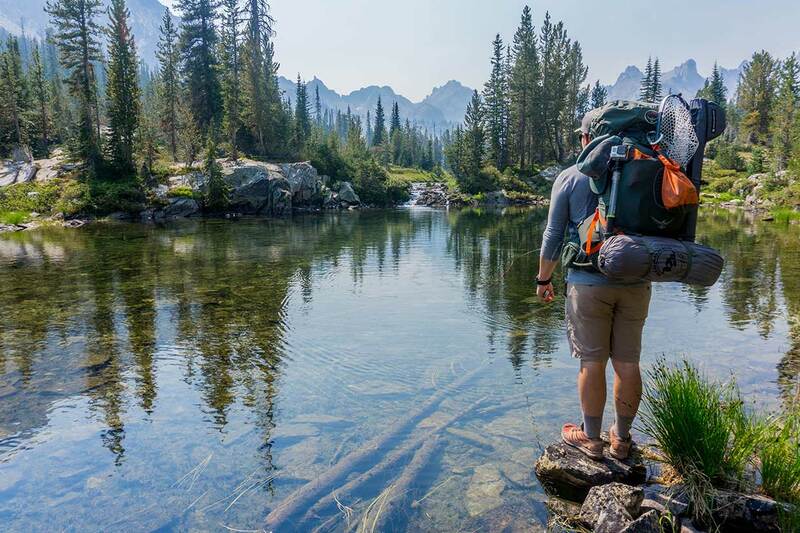 The perfect gift for men who want to take a walk on the wild side. For the person in your life who likes to try new things, this sampler delivers. Trust us, you won’t find anything like this at your local store or smokehouse. As with all of our jerky, we only use the highest quality exotic meats and hickory-smoke our jerky daily for peak freshness and flavor. Includes: Alligator, Antelope, Duck, Ostrich, Kangaroo, Wild Boar and Tibetan Yak. A well-rounded gift for men who like variety… and soap. Comprised of our best sellers, this sampler gives jerky-lovers a little bit of everything – with a little something extra. 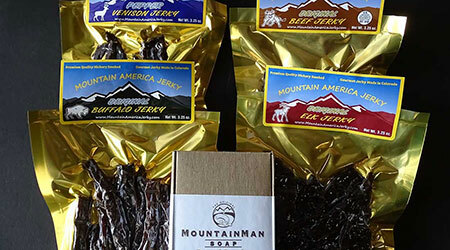 As awesome as our jerky is, this gift package for men is a step above the rest thanks to its four-pack of Mountain Man Bar Soap. Jerky and soap, you say? We think it’s a match made in mountain man heaven. Includes: Original Beef, Original Buffalo, Original Elk and Peppered Venison, as well as Campfire, Gold Rush, Lumberjack and Mountain Trail soaps. Shopping for a pescatarian? Or just someone who really likes fish? Our Catch of the Day Six Pack is all you need. 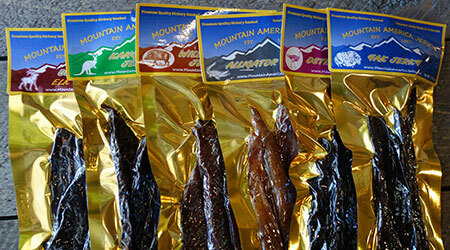 We use only wild salmon, sushi-grade tuna and other premium quality fillets for our hickory-smoked fish jerky. Includes: Original Salmon, Peppered Salmon, Teriyaki Salmon, Ahi Tuna, Rainbow Trout and Smoked Sockeye. While we think our gift packages are pretty great, we understand that people’s tastes vary. 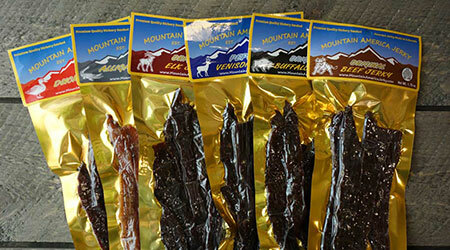 If, for personal or dietary reasons, you need to customize any Mountain America Jerky gift pack, please just let us know. Also, if you got a late start on your holiday shopping this year, don’t worry – we’re on it. All orders ship within two days of receipt and are delivered anywhere in the continental U.S. in 2 – 6 business days via USPS. So, what are you waiting for? It’s time to get some of that holiday shopping done!